"The Ambitious Wolf Cub 狼子野心 (láng zǐ yě xīn)"
This was no ordinary "Prince-to-be". The contrast between Sima Zhao and Liu Shan 刘禅 is as stark as Ivanka Trump and Paris Hilton - capable and effective versus trashy and generally useless. Despite the bulk of the dirty work being accomplished by his father Sima Yi 司马懿, Sima Zhao did not simply rest and enjoy the fruits of his father's labour. Inheriting his father's combination of cunning, prudence and patience, he seized control of Wei and became the puppet master behind the scenes, then struck down Shu kingdom in one fell swoop. As if that wasn't enough, he was also able to guard himself against the very adviser that aided his Shu conquest, Zhong Hui 钟会, who began to show signs of rebelling with the help of the enemy, Jiang Wei 姜维. But what is even more interesting is the fact that Sima Zhao did not proclaim himself Emperor of all China when he easily could have. Although Shu was defeated, Wei territory spread across China, and he alone was in control, Sima Zhao chose to leave the formation of the Jin Dynasty to his son Sima Yan 司马炎. Some say that the Sima family learnt this move from Cao Cao 曹操's family, where the formation of Wei Kingdom was delayed for two generations after Cao Cao. Though the bad guy that he is portrayed as in the story, there is no doubt that Sima Zhao was an extremely pivotal person that shaped the history of China from 250 AD till today! Character ability 1: "Obvious Intentions 昭心 (zhāo xīn)"
At the end of your drawing phase, you can immediately display all your on-hand cards. This is seen as having used ATTACK 杀 on a player within your attacking range. Limited to once per phase. 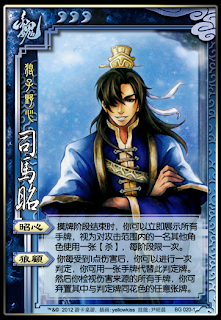 Character ability 2: "Cautious Wolf 狼顾 (láng gù)"
Whenever you sustain 1 unit of damage, you can flip a judgement card and you can replace this judgement card with any of your on-hand cards. Then, inspect the on-hand cards of the player that is the source of your damage. You can discard any of his/her cards with the same suit as the judgement card. “Obvious Intentions” comes from Cao Mao 曹髦, the puppet emperor of Wei Kingdom. As Sima Zhao’s power and influence increased day by day, Cao Mao feared that Sima Zhao would kill him to seize the seat as an emperor. Cao Mao gathered his loyalists and launched a resist, but Sima Zhao’s subordinate killed him. The name of the ability “昭心” also has the meaning of “Sima Zhao’s intention”. The mechanism of this ability is that Sima Zhao exposes his intention (showing all his on-hand cards) and launches an attack on someone (use and ATTACK on a player within the attack range). Oddly, “Cautious Wolf” refers to his father, not Sima Zhao himself. It is said that Sima Yi could turn his head 180° around on his neck to look backwards without turning his body. The game mechanism symbolizes a damage-triggered ability that involves making a judgement, correlates to the two abilities of Sima Yi. Perhaps this ability symbolizes Sima Zhao inheriting his father’s awareness to the surrounding environment and his ability to seize power? Sima Zhao can be obtained from the August 2012 issue of Zhuo You Zhi magazine, alongside *SP008 Da Qiao. It is available as an add-on "sticker" to be pasted on the "blank" character cards that are originally provided within the original pack as back-ups. The art is getting worse..
Can i use another "attack" card after using his first ability? I think the first ability may also refer to "司马昭之心，路人皆知", which means "Sima Zhao's intentions are known by every one". Is it like Si Ma Yi or can he get the card he changed to his hand? Just to be sure. The wording in Chinese is the same, so it is assumed to be the same where you switch it, but don't get the card that was changed. Thanks for answering, I'm still a very early beginner in Chinese, it's still hard for me. I'm asking because I'm trying to compile informations on San Guo Sha for my family in France, they're interested in the game so I'm doing some kind of quick guide in French. I bought plenty of cards here in China, a lot of them don't seem to be on this great website so I'll have to ask Chinese friends! I bought it in a tiny local "store" that sells sh*tloads of different things. Each little pack of cards costs 2¥, it's crazy. I got the Barbarians, lots of Demons, some pink Knights, the Immortals (Ermits), the Yellow Turbans, some Angels (not sure), plenty of other Shu, Wu, Wei, Heroes and Demi-Gods, etc. I didn't get Si Ma Zhao, I'm not into collecting the whole cards, but if they're here at my reach, I'll take them. Wow, those cards definitely doesn't sound legit, xDD But hey, whatever you can get! Google "sanguosha english", 4th link on the list. Thanks, I eventually found it. How can I know which extensions/characters are legit? These cards are so well made... Is there a precise list somewhere? All cards sold through Sinogames [the shop sister site of this blog] and the official site [http://www.yokagames.com/] are real. 2011, 2012, and 2013 expansion pack officers, and the upcoming kingdom wars expansion. Everything else should more or less be sold in box-sets and what not. To tell what's real or not, a good list to go by would be to see if the card is listed on this site [it keeps track of them by a small margin]. Then there is small changes in the 1v1 deck but that's sold seperately, so they're only legit IF you buy the 1v1 set. Same with the 3 v 3 set - some cards are 3 v 3 only. Then there are kingdom war [Guo Zhan] cards that only work for that mode, plus the upcoming expansion for it. In each of those expansions there are some Demi-god cards. All the legit ones are listed on this site. Then there is the Q-version of SGS, as well as the High School version. All on this site. Off the top of my head those are the only legit ones. Usually you can tell if a card is legit by checking to see if it's playable on the Official online game. P.S. There is "Wing" expansion that isn't official but on the NON-official game QSanguosha, it's adopted there as a balancing thing....but there is no physical card for that. Are the SP characters legit??? Do they use them on tournaments?? ?